5. Cut a 6 foot swath of grass with as little as 7 horse power. 4. Reel components ‘float’ to follow uneven terrain. 3. Mow your lawn using your golf cart! 2. Zero turn radius comes standard. 1. Scissor-action blades cut your lawn faster than a politician can spend your money. Cons: Sharpening costs tend to be much higher, mulching is not an option, wet grass, steep slopes, or fast speeds can make the wheels slip and compromise cutting quality. Features available: Three or five reels, adjustable cutting heights, ‘floating’ frames that allow for uneven terrain, ‘fold up’ outer reels. The gang mower takes a great idea ( the traditional reel mower) and makes it even better. By combining reels together on a frame, the cutting width is increased to several feet with every pass of the mower. Talk about a time saver! This mower has the added benefit of giving any lawn a more manicured appearance, since each blade of grass is cut, instead of being broken off by a rotary mower blade. Wide mowers are especially in demand where large expanses of lawn need to look their best. Prime examples are public parks and golf courses. Unlike their commercial grade cousins, the homeowner models are less expensive, as well as being more versatile. A reel gang mower made for the home may be towed by just about any slow moving vehicle of about 7 horsepower or geater, from a golf cart, ATV, or lawn tractor. When the mowing is done, just park the mower, unhitch, and drive away! The cutting reel is powered by the wheels, in the same way a push reel mower powers the cutting reel. If the wheels slip, the reel does not turn, and the grass does not get cut. Keep in mind these machines are meant to operate at a relatively low speed. Most manufactures recommend a ground speed of 4 MPH or less. 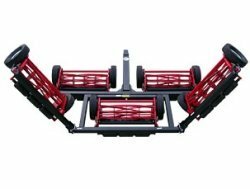 Gang mower reviews: Click on the mower brand you are interested in.